Why did I start MathTouchBook ? I started Math Touch Book after I did my first video game on mobile, one year ago. 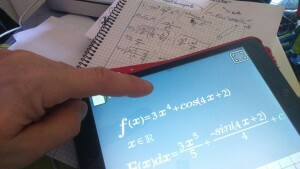 I was researching new kinds of interfaces on tablets, and also sometimes I needed to do some maths on a rough book. 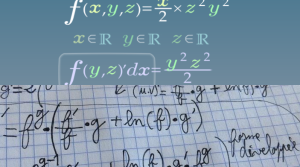 When you do math on a paper, you often write the first shape of an expression, then you write a second modified shape, then a third,… you constantly invert, simplify, develop, factorise what you write. Consequently, you can hardly imagine how big the result will be on the page, and mathematicians spend their lives struggling with page layouts. Fortunately, Equations can also be seen in “four dimensions”, transforming through time. Clearly, a mobile application could manage that aspect. I think I could be able to program an engine using graphical processing units (gpu) that would draw equations in a vectorial space, and would be able to do morphing between those shapes. Doing my previous video game, I actually made a Glyph Engine flexible enough to do that. Then a bit of tricks into the graph theory paradigm would be enough to make it a useful living mathematical tool. A second important aspect of such a tool would be automatic alignment. One of the key for learning mathematics is to write clear, correctly aligned expressions. Automatizing this could help newcomers. Plus, every math tools force the users to type one line expressions with a lot of parentheses that are hardly understandable. A vectorial space could avoid that. Another idea came while I was reading a book about the life of Richard Feynman. He told how he could see equations in colors when he was a young boy, and how it helped him to learn. Synestesy, Something great and easy to implement. At this point, I knew I could make a tool within a year of work, with a quite precise workflow. So the development began.